Asbestos has been banned from ships since July 2002; however, it is still found in over 90% of ships. More concerning is that asbestos is found in over 80% of new ships, even though the builders have declared the ships to be asbestos free. Friable asbestos gasket material in a new ship from owners supplied stores  representing a substantial hazard when you consider you can fit 2 million asbestos fibers on a pinhead. How does asbestos get into ships? First another question: when a shipyard or shipowner orders materials and specifies they are to be asbestos free, what exactly are they going to get? The term asbestos free can be misleading as there are differing national standards defining this concept. In the USA a material is said to be asbestos free if the asbestos content is no more than 1.0%; in the EU the limit is 0.1% and in Australia 0%. China, on the other hand, has no official standard. CTI Marine have found as much as 15% asbestos in materials that have been declared asbestos free in China. The problem is compounded by the fact that there is no testing and certification of materials by manufacturers. The world supply chain is such that a lot of materials and equipment originate from China, where it is still legal to use asbestos. Though Chinese manufacturers may set up production lines to supply asbestos free materials, they are reliant on their suppliers� material content declarations being accurate. In addition, they may also have cross contamination in their factories from other production lines where the use of asbestos-containing materials is an intrinsic part of the production process. Also, shipowners can themselves contaminate ships, often unwittingly, in the provisioning of materials and equipment for new or existing ships even when such supplies have been specified to be asbestos free. An interesting example of this situation arose when a well-known supply vessel company had ships built in Japan. Very keen to ensure the ships were asbestos free, as they expected the ships to operate in Australia, they flew in an Australian survey company to inspect the ship prior to delivery. As an added precaution they ordered all the spare consumable items from Australia, specifying they had to be asbestos free. Six months after going into service the ship was subjected to a flag state spot check inspection in Australia; surprisingly asbestos was found in some pipe flanges. It transpired that the asbestos was in gasket material supplied by the owner for shipboard repairs  sourced in Australia, a country where all use of asbestos is supposedly banned. Included in the scope of a CTI Marine ship survey is an inspection of owner-supplied materials just prior to the delivery of the ship. This is the only way we can be sure the ship is asbestos free and issue a certificate of compliance. The usual procedure is that a shipyard issues a declaration that a ship is asbestos free. The relevant classification society3 then makes a notation on the ships operating certificate that the ship is asbestos free based on this declaration  taking it to be a statement of fact. Several Government Flag State Authorities such as Australia and the Netherlands are aware that shipyard declarations are often inaccurate. So to ensure their ships are truly asbestos free they insist that before a ship can registered under their flag it must undergo a verification asbestos survey, performed by a marine specialist ISO17020 accredited company; any asbestos found then has to be removed before the ship can be registered. The above two nations have also been very proactive in highlighting the situation by carrying out unannounced inspections on ships visiting their ports and have documented the frequency of finding asbestos in ships with asbestos free declarations. For some reason major flag states, such as Panama, Liberia and the UK, still accept a classification societys inspection as a basis for awarding a ships annual operating certificate, even though its asbestos free status will only be based on a shipyard declaration. With ships built before July 2002, the IMO specifies that the a shipowner must have a specialist asbestos survey carried out, and if asbestos is found is required to produce an asbestos register and implement an asbestos management plan. In addition to these provisions, we at CTI Marine also recommend that the crew should undertake an asbestos awareness course, which should include a documented test. In addition to safeguarding the crew this affords shipowners some protection from possible asbestos-exposure claims from crew members, as it can be established that each had been trained to know how to avoid exposure to the recorded asbestos. 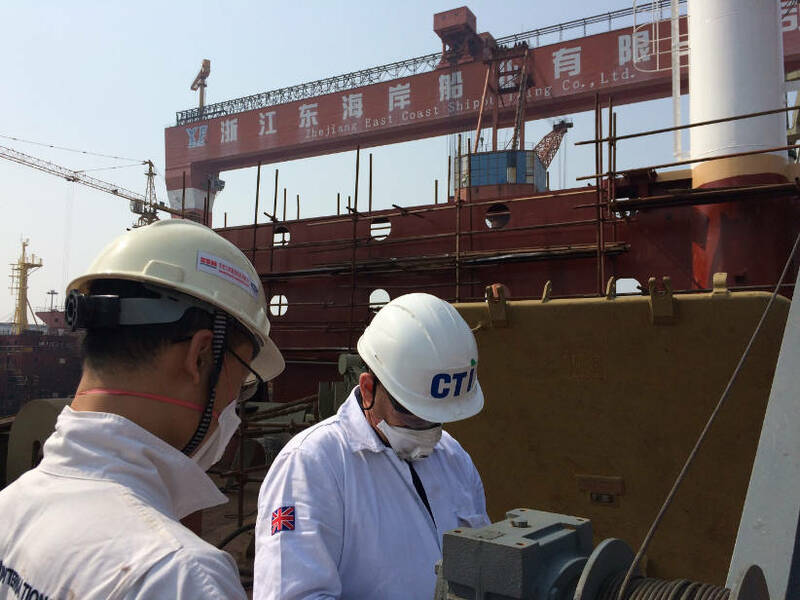 CTI Marine surveyors taking samples on new ship in Zhoushan, China. CTI Marine have years of experience in surveying all kinds of ships; consequently, we have an extensive database of where asbestos is usually found in particular types of vessel. Common locations for finding asbestos are in ships whistles, gaskets, pipe hangers, incinerators, boilers, decks and gasket material in ships stores. Why are shipowners reluctant to have asbestos surveys carried on existing ships? Shipowners are reluctant to have asbestos surveys carried out on ships that are currently in compliance, as in their opinion it is enough that they have asbestos free declarations which are accepted by the classification societies as statements of fact and which, in turn, are accepted by most flag states that register the ships. They don't want to generate the potential headache of asbestos being found  as a result they would have to apply for an asbestos fee exemption certificate from the flag state authority, which would then give them three years to get the asbestos removed. That said, shipowners have a duty of care for their crews and anyone that works on their ships, so considering the well documented extent of asbestos present in ships, they should, in all conscience, have specialist surveys carried out. We find it appalling that many flag states ignore this situation and continue to accept shipyard asbestos free declarations. In an effort to encourage shipowners to determine the condition of their ships, CTI Marine have introduced a risk based survey, which is somewhat cheaper than a full compliance survey. This relies to a greater extent on a visual inspection and only around 25 material samples are taken, compared to the 100 or so taken in a full survey. 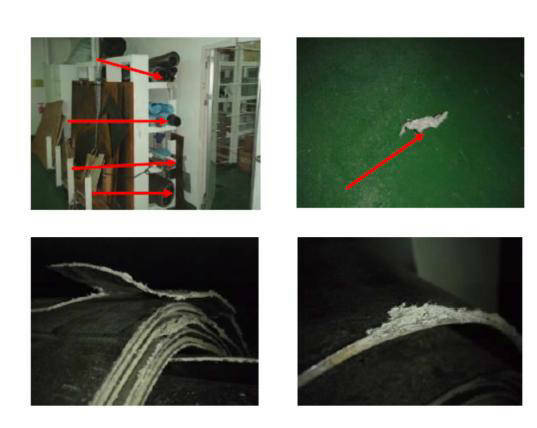 One well known ship management company requested us to perform a risk based survey on a Japanese ship built in May 2002; out of 25 samples taken, 16 were positive for asbestos and 9 of those had asbestos content of between 15 and 50%  even we were surprised. By contrast, we carried out a full survey on a sister ship built 5 years later, finding asbestos in only 6 places  an indication that the Japanese asbestos ban in force from July 2002 was impacting shipboard contamination. Is asbestos just a Far East problem? No. CTI Marine has found that ships built anywhere in the world can be affected; for example, a 2008 Norwegian built ship was found to have asbestos in an incinerator, even though the incinerator was built in Norway, one of the first countries to impose an asbestos ban. We have also found asbestos in a new ship being built in Chile. However, the problem might well originate in the Far East. China is a huge global supplier of construction materials and equipment globally; these will be incorporated in a vast array of items manufactured elsewhere. Very often, users of the Chinese products carry out no testing themselves but rely on the asbestos free declarations accompanying them  a ridiculous situation. 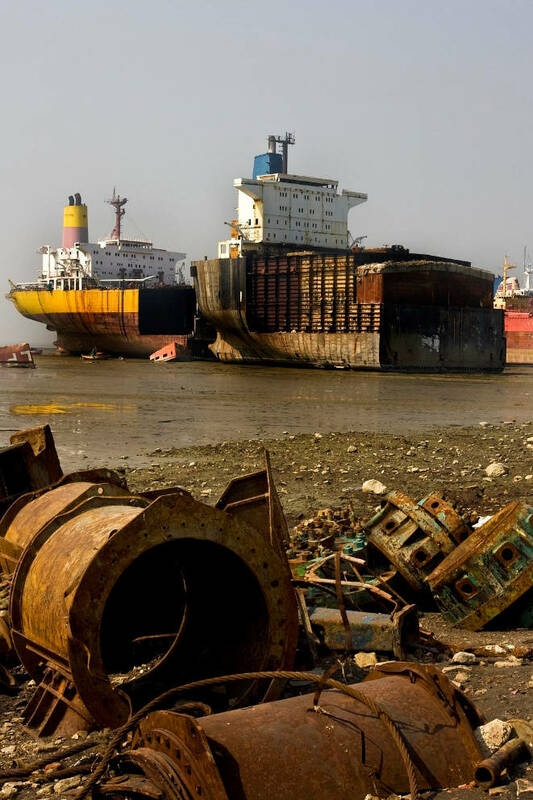 Ship breaking in Alang, India. In 2013 the EU established progressive timelines to implement an EU directive, that all EU ships should have an Inventory of Hazardous Materials (IHM) by 2018. New builds have to have an IHM; but again this is only based on the suppliers declarations. The IHM can be used in assisting scrappers to develop a ship recycling plan to remove and correctly dispose of hazardous materials to international environmental standards. Internationally, the Hong Kong Convention of 2009 stipulates that all ships have to have an IHM; however, the process is still waiting for sufficient countries to ratify the regulation. The EU directive for all European ships is expected to come into force by 2018. It should be noted that an approved IHM involves an asbestos survey, representing about 60% of the IHM. For DNV GL4 to accept an IHM as part of a ships certification they advise ship owners to have the IHM produced by an approved company and will not accept IHMs produced by a shipowner on the basis of having attended a Hazardous Material Expert Course. These (four day) courses are only intended to give an overview of what is required to produce and maintain an IHM. A CTI Marine survey on ship that had an asbestos free certificate that was going on charter to Australia found asbestos in several locations. have an update survey performed after a refit. protects the crew and anyone working on the ship. Some major shipowners, such as CMA and Maersk, are proactive and get us to survey their new builds. As the situation of asbestos in ships becomes more well-known, we expect more shipowners to protect themselves and have asbestos surveys carried out on their ships. Since asbestos still infiltrates the marine industry via products made in China you would expect a similar situation to occur with land-based construction, worldwide. 1 Centre Testing International Marine services (abbreviated to CTI Marine in this article) is an international accredited ship survey organization. 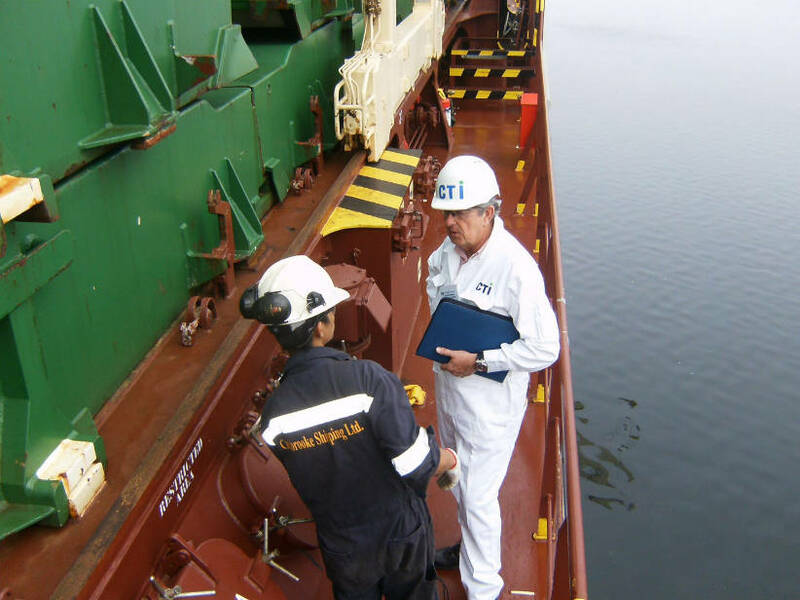 Currently, CTI Marine is the only company in the world with an ISO17020 accreditation specifically for asbestos surveying of ships. 3 There are more than 50 classification societies located at various ports around the world; they are non-government organizations. Currently, around 20% belong to the International Association of Classification Societies, where there is more conformity of regulations and practices than for the non-associated societies. 4 DNV GL is a global certification body and classification society. Its marine division is by far the largest classification society in the world, with a portfolio of shipping and off-shore structures representing more than 20% of the global market.